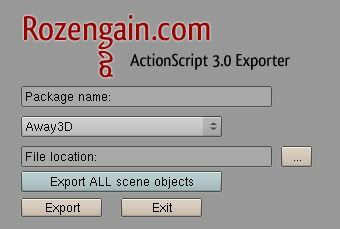 This entry was posted on Sunday, June 14th, 2009 at 1:27 pm	and is filed under 3d, 3D ENGINES, ACTIONSCRIPT, ACTIONSCRIPT3, AS3, AWAY3D, blender, FLASH, GAMEDEV, GAMES, PAPERVISION, RENDERING, SANDY, TECHNOLOGY, TOOLS, Uncategorized. You can follow any responses to this entry through the RSS 2.0 feed. Both comments and pings are currently closed. Instead of creating an exporter to AS3 for ONE modeler, why not creating a COLLADA->AS3 converter as a stand alone application. This would enable anybody to use this compiler rather than limiting to Blender users ? True. COLLADA is a great format but there are still differences and variations in exporters. 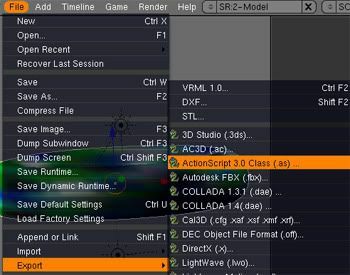 In fast you’d think that Autodesk products (3dsmax, maya, etc) would have better common output of this format but more focus has gone into FBX a proprietery Autodesk format. I think a standalone COLLADA to as3 converter would be excellent and a great project, but it seems easier than it is whenever you deal with exporters and formats. There are just so many edge cases.